on this picturesque, less-crowded trail." 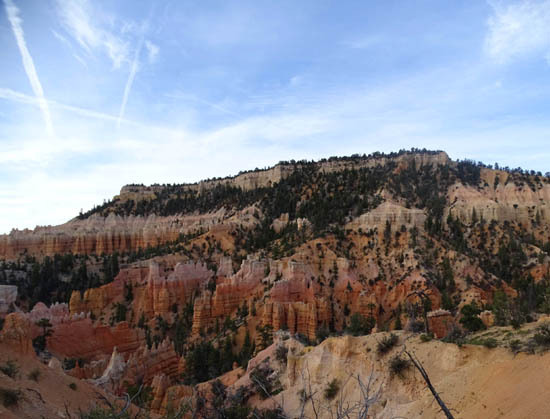 The first time I hiked this 8½- to 9-mile loop I took over 600 photos. 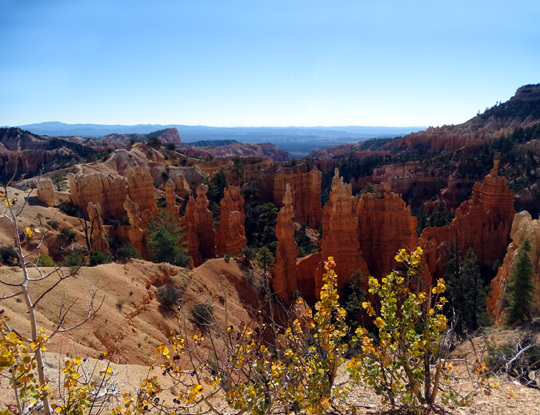 It quickly became my favorite trail in Bryce Canyon. I hiked it three times this fall and convinced Jim to go with me one of those times. It's the longest hike he's done in quite a while. He rates it second to Peekaboo. 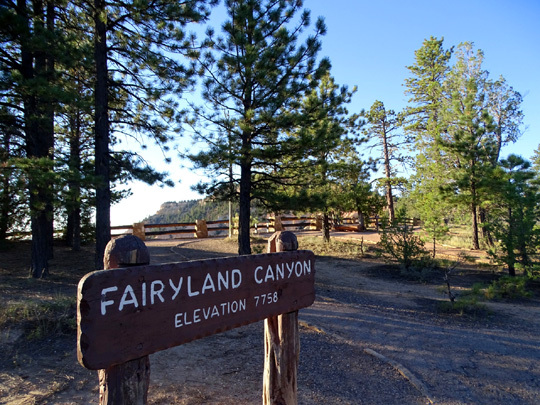 I like Fairyland even better, so much that I hiked it several more times in the spring and fall of 2016 on our second and third trips back to Red Canyon RV Park. So expect even more pictures next year! I marked the Fairyland Trail in yellow. 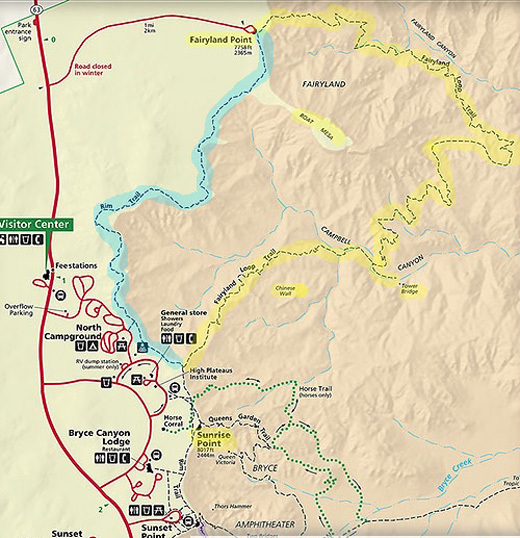 By itself, it's about six miles long (add another half mile if you go back to Tower Bridge) -- whether you start at Fairyland Point and hike clockwise or begin at the trailhead on the Rim Trail a little north of Sunrise Point and go counterclockwise. 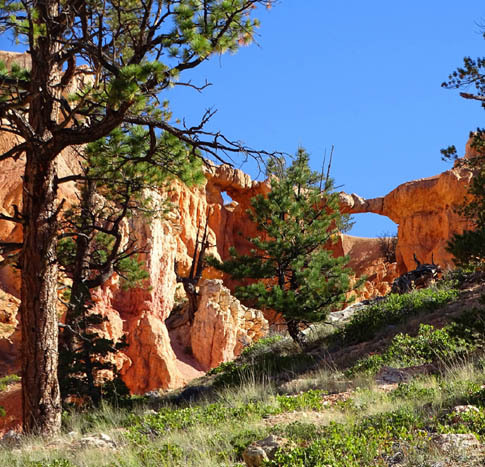 Either way, you have a gap of about 2½ miles at the beginning or end of the Fairyland Trail. 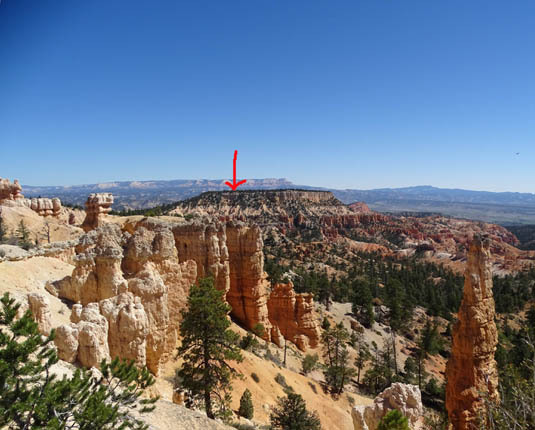 There are two ways to close this gap -- hike the Rim Trail, too (it's marked in blue on the map above) and make it a real loop or spot two vehicles so you can eliminate the extra miles on the Rim Trail. 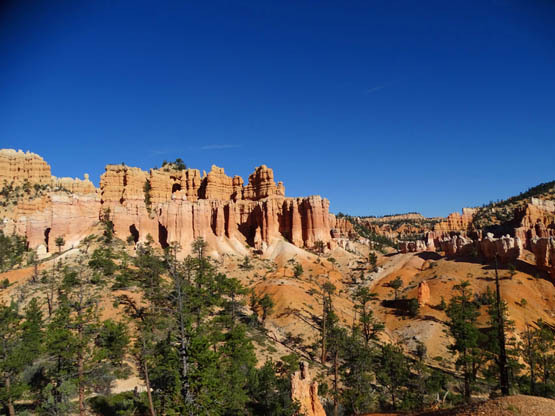 Note that the park shuttle buses don't go to Fairyland Point so that isn't an option like it is for some of the other trails in Bryce Canyon. 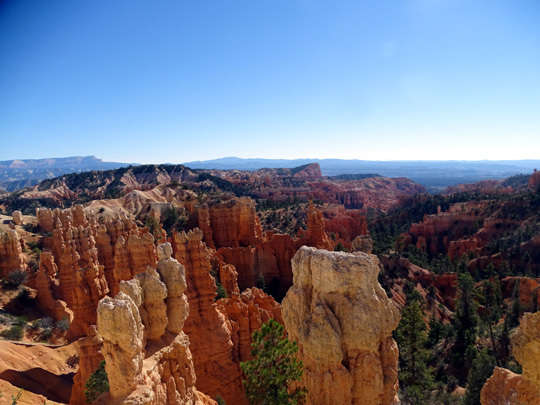 Bryce Canyon has lots of "windows" (hole on left) and "bridges" (on the right). All three times I hiked the Fairyland Trail I did the whole loop, including the Rim Trail and the short spur trail out and back to Tower Bridge. I did the loop a little differently each time. 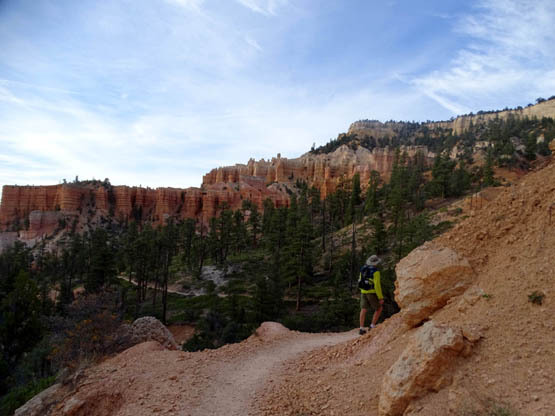 I experimented with parking at both trailheads, hiking both CW and CCW, and either starting on the Rim Trail or finishing the hike along the rim. 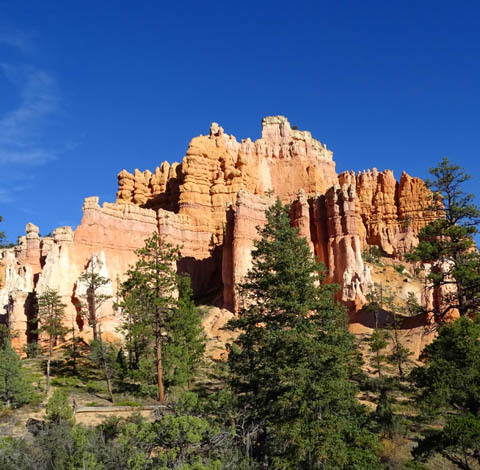 By the third hike on the Fairyland Loop I had a definite preference -- park in the shade near the general store at Sunrise Point, go north on the Rim Trail before it got hot, go clockwise on the Fairyland Trail, and come back up near the car at Sunrise Point. I also did it that way almost every time on our second and third extended visits to the area in 2016. Regardless of which way you hike the loop, stop often to look up and all around. Every time I hiked the trail in 2015 and 2016 I saw some new things. Fairyland Point has limited parking but you should be able to find a spot before 9 AM in the spring or fall (we haven't been here in the summer). The road to the parking area is located before you get to the entrance gate. 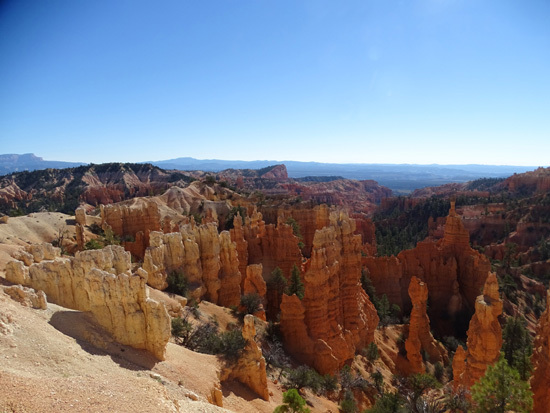 It is not marked going that direction and you can't see the parking area from Bryce Canyon Road. There is a sign for the road on the way out of the park. Pretty sure we know why they did it that way, and it's smart. Do you see Boat Mesa on the map above? It's in the middle of the loop and I marked it in yellow. The Fairyland Loop encircles this large plateau. 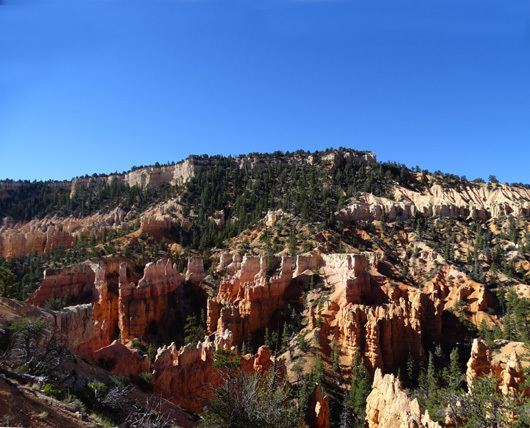 It looks small on the map but it's visible along much of this loop and from all the overlooks on the rim between Fairyland and Bryce Points. You'll see it in a lot of these pictures; it looks different from every direction. Arrow marks Boat Mesa as seen from the Rim Trail between Sunrise and Fairyland Points. 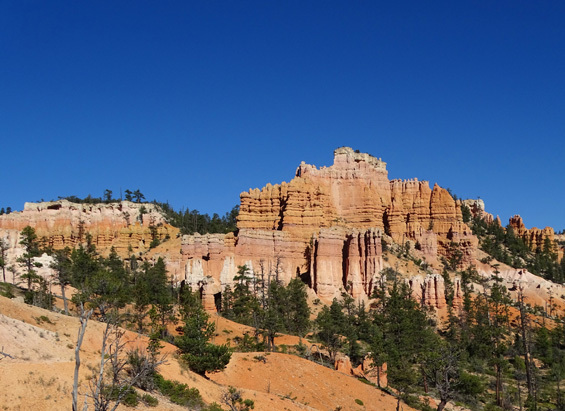 Most visitors to Bryce Canyon don't have the time or ability to do this entire hike. Some of them just go down to Tower Bridge and back up, a total distance of three miles with a significant elevation gain and loss. 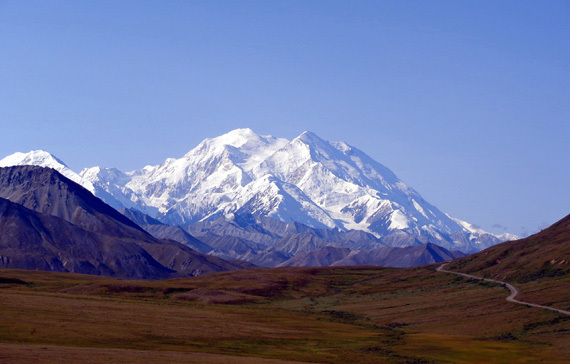 In my opinion, if that's all the time you have, a more scenic hike would be the Queen's Garden and Navajo Loop. 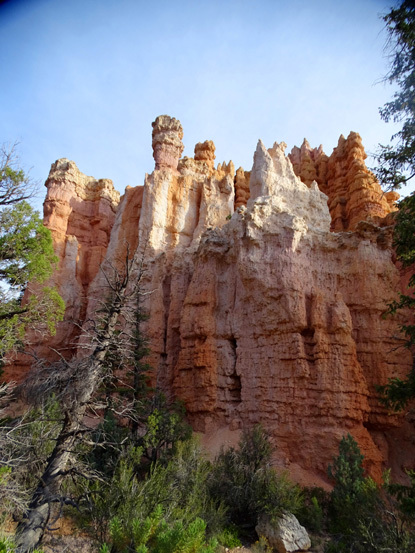 I think the rock formations on the Fairyland Loop are more spectacular on the northern half of the loop -- going down from Fairyland Point -- than the south side where Tower Bridge is located. 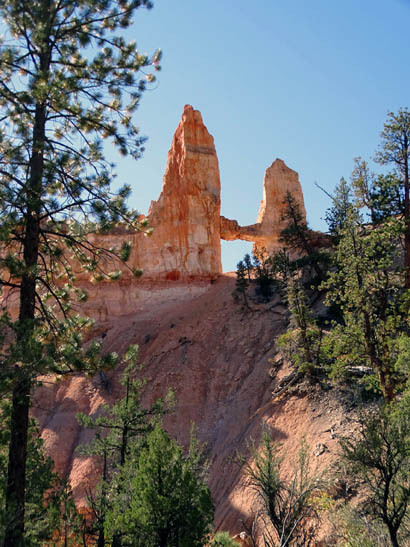 The National Park Service rates the Fairyland Loop as strenuous because of its length, altitude (approximately 7,100 to 8,200 feet elevation), and elevation gain and loss (over 4,000 feet total). If you're used to hiking hilly trails at this altitude or higher -- and for this distance -- I'd rate the Fairyland Trail as "moderate" difficulty. I heard more grumbling from unprepared hikers on the Peekaboo Trail than Fairyland. 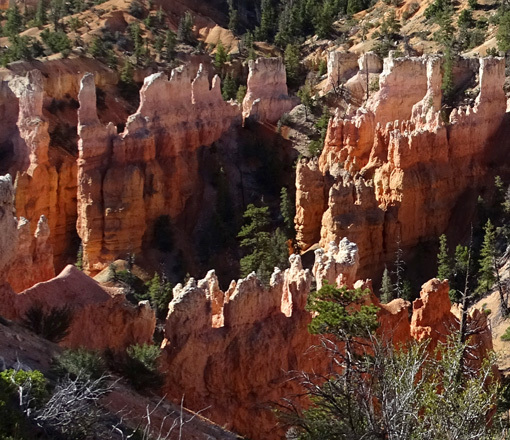 In addition to the fantastic rock colors and formations, there are other things to love about the Fairyland Loop. 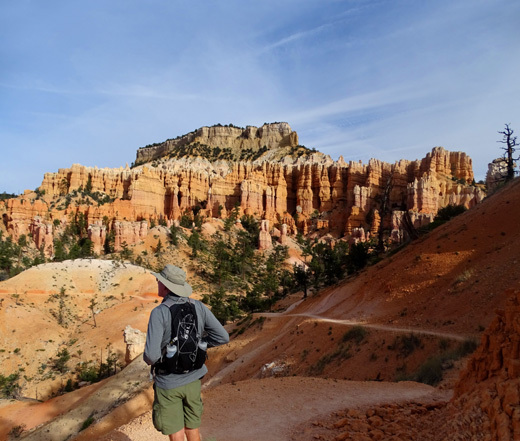 For one thing, not nearly as many people hike it as the trails closer to the main Bryce Amphitheater (Navajo, Queen's Garden, Peekaboo, and Bryce Point). The busiest section of the Fairyland Loop is the least scenic, in my opinion -- from the rim near Sunrise Point down to Tower Bridge and back. That's where I've seen the most people on this trail. Ironically, it's the steepest, longest descent and ascent on the whole loop. On the other hand, I've hiked clockwise from Fairyland Point in the morning without seeing anyone on that side of the loop for several miles -- and I think that's the most scenic part of it. When I'm hiking alone it's interesting to talk with some of the other hikers but I like the quiet solitude of having only a few other people around. YMMV. Fairyland has some long ascents and descents but none are very steep. The loop is a roller coaster, with only a few sections that are relatively flat. 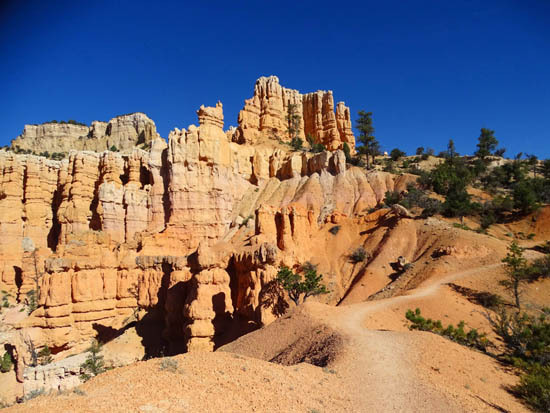 The trail is mostly in the Bryce Canyon Wilderness so it is more narrow in some places and a little more rough than the heavily-used trails in the main amphitheater. 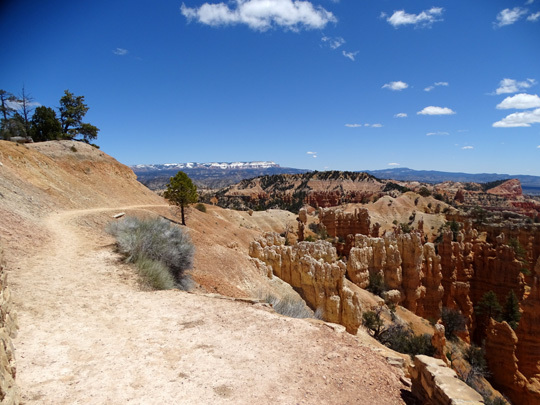 Like other trails in Bryce Canyon, this is high-desert country with arid conditions and a lot of open, sunny areas that feel hot even if it's only in the 50s or 60s F. Carry plenty of fluids. There is no potable water or any restrooms on the loop. I haven't even seen any water in the washes. 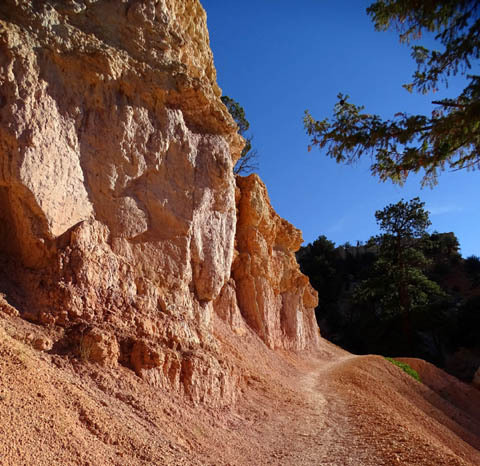 After it rains, parts of the trail can become muddy, sticky, and/or eroded but the sandy-rocky surface dries out quickly. Dust is much more likely than mud. 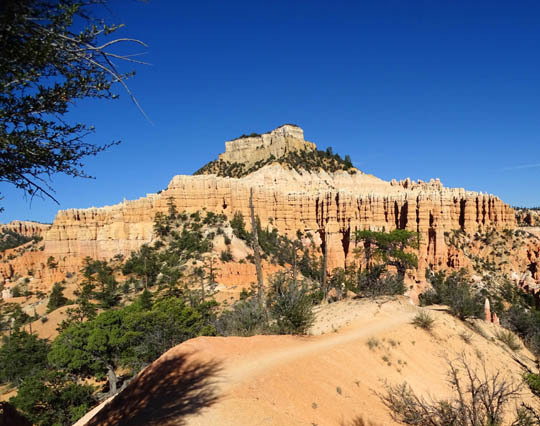 The Fairyland and Rim Trails are hiking only so you don't have to dodge any horse poop. Since my preferred direction to hike this trail is clockwise these photos start at Fairyland Point, go back the spur trail to Tower Bridge, ascend to the intersection with the Rim Trail about a quarter mile north of Sunrise Point, and continue north along the Rim Trail to Fairyland Point -- a total distance of about nine miles. Jim stops to absorb the fantastic scenery halfway around the Fairyland Loop. Boat Mesa is poking up in the background. Like the Peekaboo Trail, most park visitors never experience this entire loop. These photos are from three different hikes. 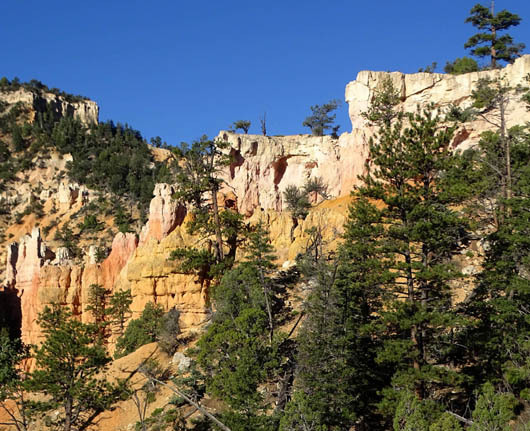 I'll include over 100 pictures on four pages so readers can see a spectacular area of the park they may probably haven't seen -- and maybe some will decide to hike it and experience its wonder for themselves. Jim rounds a curve as the trail winds in and out of small side canyons. 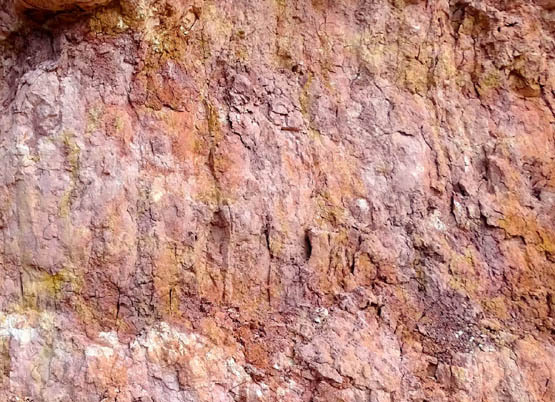 where else are you going to see purple rocks except southern Utah? The formation on the right is the one you pass in the next quarter mile when going clockwise. 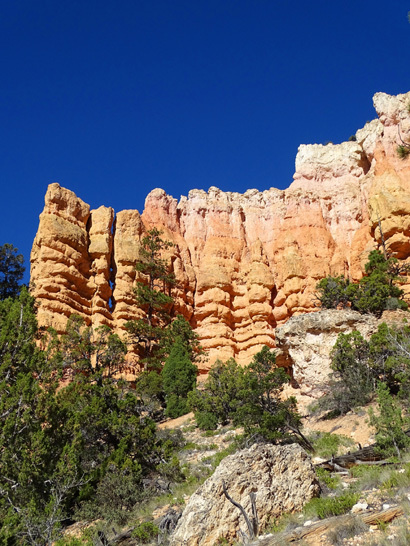 I think it's one of the prettiest formations in the whole park.